It’s the second day without power in the aftermath of Hurricane Sandy. Mark and I had no choice but to leave our cold, dark home and look for a cozy warm place that offers WiFi so we can get back in touch with the world. Thankfully, we found The Coffee Beanery in Garwood, NJ. Sipping hot tea I wanted to share some reflections from the last few days. Mark conducting a video call with coworkers. Nothing can stop us from being productive! Although it’s hurricane season, it’s highly unusual for hurricanes to make it all the way up north to Maine. Except for Hurricane Irene last fall and Hurricane Sandy on Monday, we rarely see natural disasters of the magnitude the South and Midwest see each hurricane season. We, North-easterners, have that invincible attitude that we live in a disaster-proof region. Or so we thought. 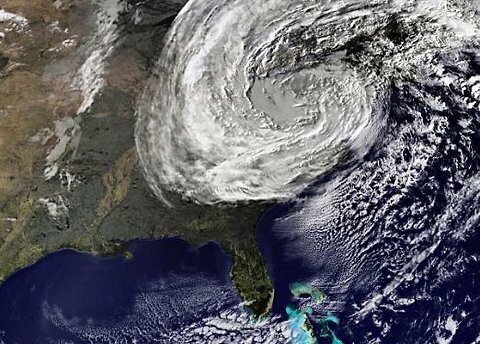 According to NASA, Hurricane Sandy covered 1.8 million square miles, from the Mid-Atlantic to the Ohio Valley, into Canada and New England. Hurricane Sandy proved to be the kind of a natural disaster that nobody could have done enough to prepare themselves. The hardest hit areas, South Jersey and Lower Manhattan, were demolished beyond recognition. Shore houses were washed away, boardwalks were ripped off, homes were flooded. In Downtown Manhattan, both Hudson and East Rivers, spilled over to completely saturate streets, subway stations and pass-through tunnels. The most fascinating thing about Hurricane Sandy was the way it brought destruction. It was not rain that caused floods. It was a monstrous tide surge and crushing wind speeds. For South Jersey and Lower Manhattan the tide was the equivalent of the tsunami that struck Japan in 2011. The physical damage is as big if not larger than in Japan. We have yet to learn of the actual dollar number but it’s safe to say it will be in the tens of billions of dollars. Lower Manhattan below 35th Street went completely dark due to a reactor explosion caused by Hurricane Sandy. Huge lines for gas at the few still open gas stations on Rt. 22 near Union, NJ. The “positive” news, however, is the low number of fatalities Hurricane Sandy left behind – 59 as of today. Much credit goes to the Authorities that ordered evacuation of the shore fronts and closed all subway stations and tunnels in NYC. Had it not been for the clear and persistent efforts to keep people safe, the death toll from Sandy would have been devastating. There is another thing to be grateful for post Sandy – the unity of human beings. With less than a week left to Election Day, people seized to focus on political differences, and instead joined hands to work together to help those who were hit the hardest on Monday. I wish that was the dominant attitude in Washington, not something that only happens after terrorism attacks and natural disasters. As for my family, we are fortunate to be okay without any major damage or loss. Where we live, Linden, NJ, the worst is the power outage which has no end in sight. PSE&G reports it may take up to Monday to restore power to all homes in that lost electricity in NJ. In addition, we don’t have hot water, heat or Internet service. Cell phone service is sporadic and unreliable. In moments like this, you begin to recognize the joys of simple pleasures such as being able to turn the switch on, taking a hot shower, having a roof above your head or enjoying a warm meal. On any given day we take those seemingly ordinary events for granted until they are taken away and we realize how essential they are for our survival. Hurricane Sandy will surely be one of those events that I will remember for a lifetime. But rather than focusing on what was lost, I choose to remember what I am blessed with – a healthy and thriving family, sound home, sufficient money in the bank account, enough gas in the car, and a hot meal that mom prepared for us tonight. All else can be fixed. Please take some time to reflect on your blessings and say a prayer for those who lost life and/or property during Hurricane Sandy. Better yet, if you can, help somehow whether by donating money or physical help to someone in need. May God bless us all. Zoe,radvam se 4e ste dobre.Badete blagosloveni! Zoe… wow. A nice write up!!! Better than newspaper – more personal. Thanks for sharing. Hope all will have power sooner than planned. Last year we had no power for 10 days. It was no fun. Thank you Zoe for taking the time to share your thoughts and perspective in the midst of so much disruption. Wow, thank you for sharing this in depth account of the brutal effects of nature. Zoe, you are a remarkable writer who captured the losses succinctly and beautifully with photos, captions and perfect words. And yes: for many of us, there is much to be grateful for. And one of them is you! I love your attitude and the strength and focus behind it! You’re an inspiration! thank you for putting the word out – i live right by Garwood! – i just got power 2 days ago – so many of my friends live on the barrier islands and lost EVERYTHING – even know of people who lost their lives- my boyfriends Mom in Staten Island lost her house too – my house is pretty damaged – car crushed – still in survivor mode and we have another storm coming in a few hours!